Spicy to a fault, the intense heat of this sauce quickly masks at lot of the other good flavors going on. Hailing all the way from Girdwood, Alaska, this sauce has its roots in something very near and dear to my heart—chicken wings. 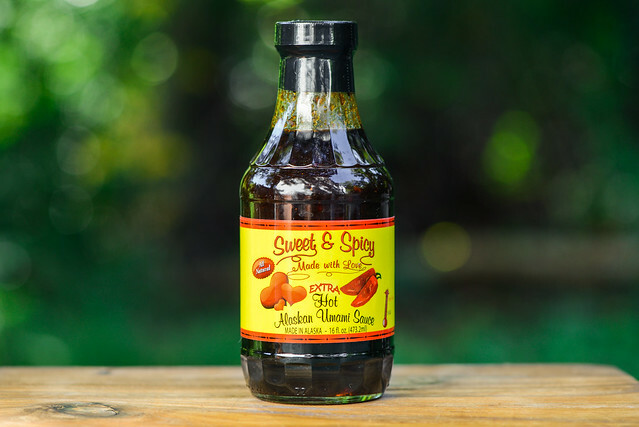 Pam Turner, the creator, developed the sauce specifically for wings over twenty years ago, then slowly came to realize it can do a lot of good beyond those tiny pieces of chicken alone. Once she saw how much she liked it in everything from stir fry to salmon, she started bottling it and began spreading the word about her "Alaskan Umami Sauce" which now comes in three different varieties and is backed by a host of awards. The base aroma of this sauce can be easily likened to a teriyaki sauce. 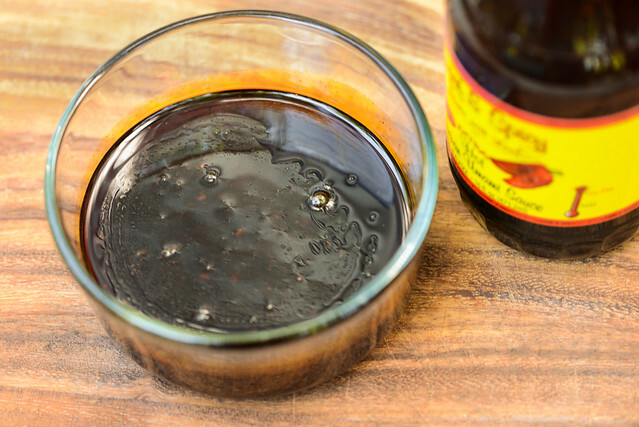 It has equally strong sweet and savory components that are akin to heavily sugared soy sauce. There's definitely a barbecue tilt to it though by way of a mellow vinegar tang and a very heavy and distinct smell of molasses. In the undertones, you can pick up hints of garlic and a bit of heat. Man, this is one thick sauce. After sitting in the fridge, I had to zap it in the microwave for 30 seconds to loosen it up enough to pour from the bottle. What exited was a very dark, reddish-brown and opaque sauce. In the initial pour after first opening it, there was a orang-y oil slick on the surface that wouldn't combine, even after stirring it with a spoon. The sauce had some bits of garlic that gave it a little texture. From a suspended spoon, the sauce had syrupy pour that released in a very slow, steady stream. Once finished falling, a medium, semi-transparent layer of sauce was left clinging, in which I could see tons of small and large spice specs that weren't visible when the sauce was more concentrated together. The sauce started out tasting like a spoonful of sugar that gained body by way of molasses. There were then fleeting tastes of onion and garlic right before the heat began to take hold. The spice was mild at first, but quickly ramped up in intensity to a mouth scorching climax. It triggered a hiccup response in me, which only happens with the spiciest of sauces. There was no depth to the heat—it tasted like pure capsaicin without the defining features of any particular chili. Because the heat was so strong, it drowned out everything else and left an aftertaste that is best described as burning. The sauce coated the chicken in a medium thick, glossy layer. The sauce baked down well over indirect heat, and the areas that were touching the grates picked up a bit of caramelization. 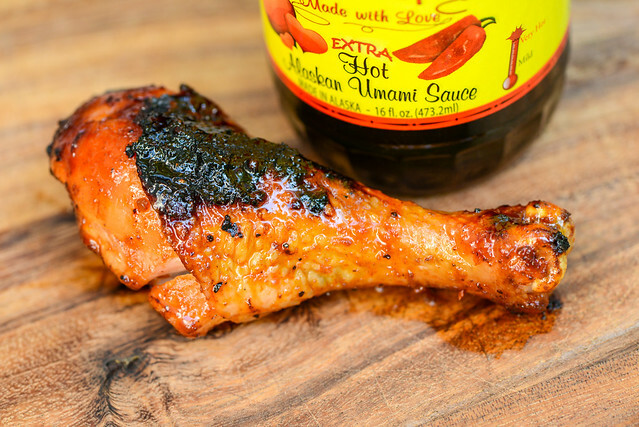 Once moved to direct heat though, the sauce quickly blackened and burned, leaving a large swath of char on the leg. The sauce retained its heats after being cooked, but became much more manageable. 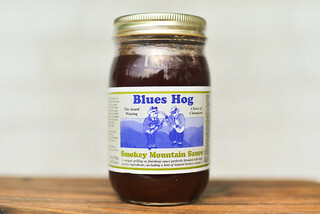 With a little loss to the hot edge came an increased prominence of the molasses and an enhanced savory quality. Although burnt in appearance, those charred parts weren't all that bad and had some good sweet flavor that didn't ruin the chicken at all. I was taken with the Hot Alaskan Umami Sauce—it had a great balance between heat and sweet and certainly tasted like a suburb wing sauce. The Extra Hot took things a bit too far though. The added heat forced the other ingredients into submission, which made the sauce lose some of its robustness. Then that heat didn't have much depth to it—it tasted like it was just spicy for spicy's sake and didn't have any pepper complexity. After being grilled, there was a bit better balance between heat and sweet, which let the savoriness shine, but it was still done in a better fashion with the Hot recipe. I would say that unless you're looking for a mouthful of fire, skip the "Extra Hot" and go for the "Hot" only, which still delivers the heat, but also a whole lot more.